For each person you have registered, please be sure to enter first and last name(s). 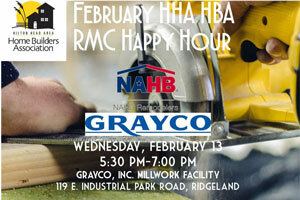 Join host Grayco, Inc. for BBQ, brews, and building at their millwork facility in Ridgeland at the February 2019 RMC Happy Hour on Wednesday, February 13 starting at 5:30 pm. RSVP online, via info@hhahba.com, or by calling 843-681-9240 today!